The G-Core shaft technology significantly stabilizes the shaft with a triple-layer carbon fiber core at the front impact area of the shaft. G-Core technology increases shaft stability by 65%, promoting increased accuracy with enhanced radial consistency. The G-Core also utilizes our proprietary CT Technology: a carbon fiber ferrule core that results in greater strength, efficiency and precision. Selected from the finest quality pig skins in the world, Everest Laminated Cue Tip is the most sophisticated, durable and advanced cue tip created. Each layer is carefully selected and split. From these splits only the ten most even and durable layers are chosen. By vacuum laminating with our own VACULAM™ process, Everest cue tip becomes the best laminated cue tip ever. Each Everest Laminated Cue Tip is individually tested for consistency, hardness and quality. Special red layer warns when to replace the tip. 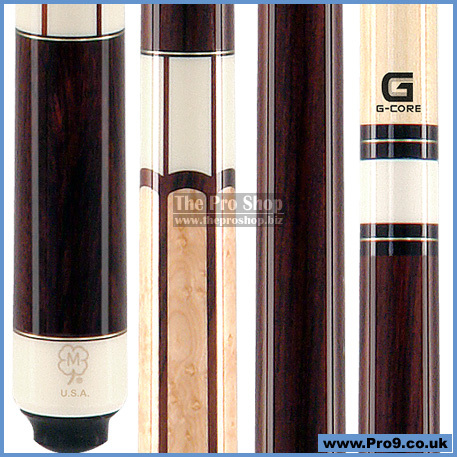 This cue tip shapes like a hard tip, hits like a medium and has a control like a soft tip. Carbon fiber extends through the shaft wood and into the ferrule with an additional dampening device to reduce vibration. This results in a stronger ferrule assembly with maximum impact properties and enhanced feedback. The G-Core triple-layer design stabilizes the front impact area of the shaft, reducing vibration and minimizing shaft distortion. The carbon fiber layer increases radial consistency, promoting enhanced accuracy and stability.